Join in on LeadGood Live! As compliance professionals and leadership counselors, we focus on “tone at the top.” What the C-Suite says is critical to establishing an ethical culture in an organization. What is even more important to foster that culture is whether top executives speak and act consistently. We advise our leaders that even one act of apparent hypocrisy, or of “looking the other way,” can undo a lot of cover-letters-with-Codes-of-Conduct. With this perspective, I commend to you two recent blog posts by fellow compliance lawyers, about the tone coming from the very top, compliance wise: the Department of Justice. One is Mike Scher’s post this week in the FCPA Blog about the DOJ’s findings that downplay the alleged corruption violations by WalMart in Mexico. The other is Michael Volkov‘s comment on the outcome of the DOJ’s investigation at General Motors, first published in September but recirculated through LinkedIn this week. At the SCCE’s annual Compliance and Ethics Institute earlier this month, I perceived a consensus of approval among the compliance community for the DOJ’s September 9th “Yates Memo,” in which Deputy Attorney General Sally Quillan Yates sought to send a strong message that the DOJ would henceforth be eager to prosecute culpable individuals for wrong-doing within the corporations they lead. There were many concerns (see this and this), yet the general thought seemed to be that the tone set by the Yates Memo would reinforce our efforts to get buy-in within our companies. But Mike Volkov raises this concern: with the GM case (as now with WalMart), do the DOJ’s actions speak louder, tone-wise, than Yates’ words? This was not a big FCPA case against a big company. Siemens wound up shelling out some $800 Million in fines and disgorgements. But Lukas could wind up with ten years in the slammer. So I think the Lukas case is a more potent warning. 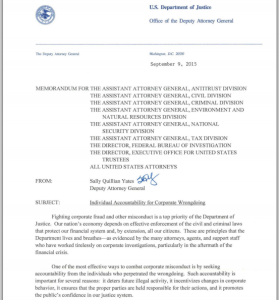 It says that FCPA enforcement won’t be limited to monster claims against ginormous companies. Any company can get nailed, and more to the point, executives who are not little Madoffs can still go to jail. Consider that, next time you hear an exec acting like her lawyer’s warnings about FCPA are the compliance equivalent of the Boy Who Cried Wolf. And on the positive side, setting up the training, and systems, and monitoring, to mitigate the risk of FCPA violations can pay corollary benefits in terms of setting”tone from the top.” You can always quote JFK, and say your team should do it because it’s hard. #EthicsMadnessII starts TODAY (3/16) at 2 PM Eastern! Join in on LeadGoodLive! 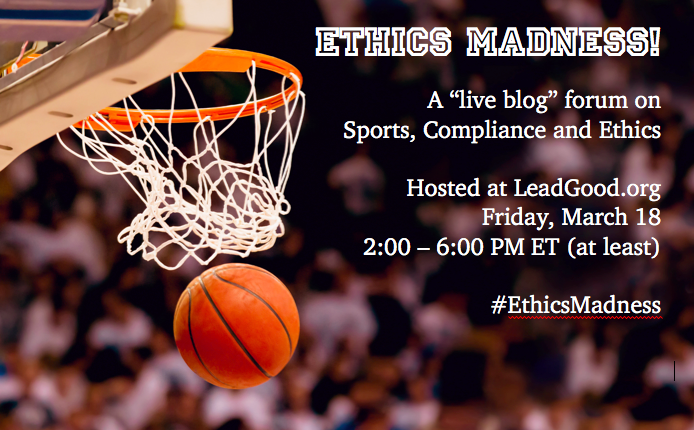 this afternoon as we live-blog about ethics, compliance, sports, education and #MarchMadness!